Walk in the paths trodden by the feet of the great sages. Revere the righteous canons of the empire. He that has not learned the sacred doctrines, how can he govern himself? He that is ignorant of the classics, how can he regulate his own conduct? With the final great wave of political upheaval settled, with the collapse of the Satsuma Rebellion in 1877, Emperor Meiji commanded that the Imperial Household to re-establish the Peers’ School in Tokyo, providing for the additional enrollment of children from Japan’s newly established industrialist and mercantile classes. Education at Gakushuin at that time was characterized by a stronger emphasis on military education and physical exercise. Swimming, martial arts and equestrian skills were all incorporated into the Gakushuin curricula. The school also adopted a naval officer-type uniform for male students in 1879 and, in 1885, its students began to use school satchels modeled on military backpacks. 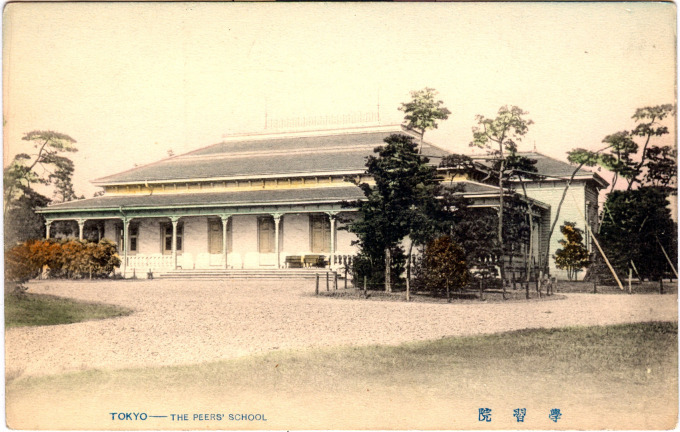 A decade after the founding of the Peers’ School, in 1887, Empress Haruko established the Peeresses’ School. The two schools would merge in 1906.